Pastor John Steger and Sgt. Grant Snyder speaking on the partnership with the MPD and Grace in the City, including a visit to The Hub. Pastor John and other business leaders with Mayor Frey and Chief Arradondo at Press Conference July 16th, 2018 regarding the Charter Amendment. Steger heads up a unique ministry in Downtown Minneapolis. The church began in 2017 by taking over a coffeehouse. They quickly found that their downtown home is not only in the center of business in the Midwest city, but also inhabited by dozens of homeless men and women. They developed a model of outreach that was recently renamed “The Hub.” It’s a cool coffeehouse that offers everything for free from lattes and croissants to sandwiches and salads. 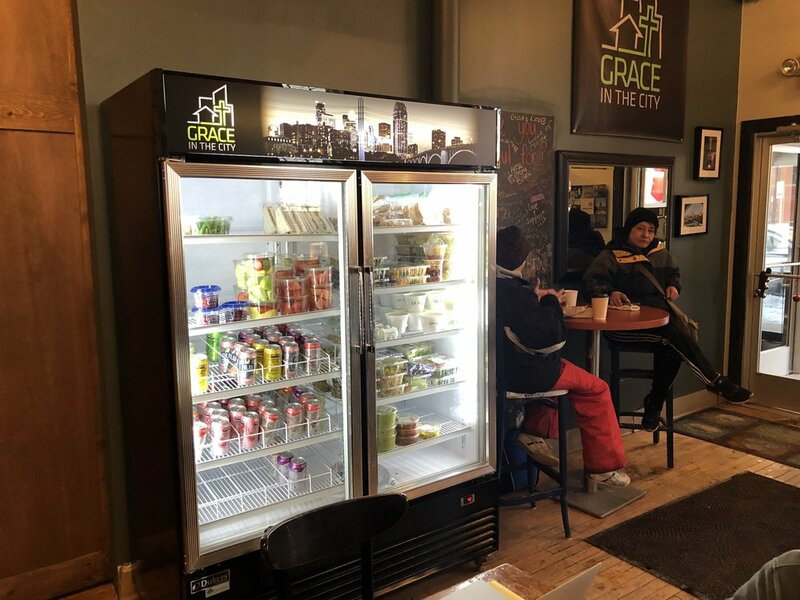 The Hub is open Monday through Saturday, and on Sunday becomes Grace in the City Church. When the polar vortex pulled subzero weather into the Twin Cities, pastor and police sergeant knew they had to take action. “We’ve been doing weekly outreach on the street. 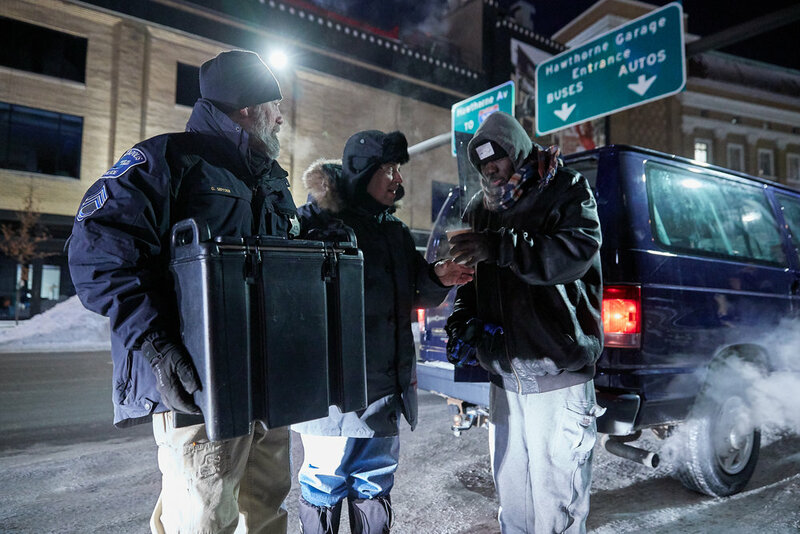 When these temperatures came, we knew the severity and wanted to make sure people have everything.” The pair has been out every night, as the wind chill hit minus 50, handing out hats, gloves, scarves and, of course, hot coffee and food from The Hub. Steger, who stepped out in faith to start the ministry in 2016, related another tense situation that required several officers and an ambulance. “We went out Tuesday night and, literally, this guy wouldn’t leave his tent. He was starting to have frostbite.” The officers urged the man to get into the ambulance. He didn’t want to lose his spot or his possessions. Snyder had his head in the tent and Steger was back near the police vehicle praying. “The man was saying to Snyder, ‘I feel the Spirit’s presence here.’ Snyder asked, ‘What do you mean?’ He said, ‘Why don’t you go ask the pastor?’ It was crazy. He knew I was there, but I don’t know how he could recognize my face behind my hood and my hat.” Steger said a peace came over the situation and the man was taken to the hospital. They have seen situations like this turn violent in the past. Even though the extreme cold has lifted for some Midwest states, Steger empasizes, “The cold is not over for us. It stays cold for a while.” The pair will continue to hit the streets because “people know that when they see us, they’re getting something. They know they’re going to get the love, and we’re not going to judge them.” That means an open door to reach out and build community. The Hub exists to serve anyone in need, but Steger points out that it really is all about sharing the gospel. “We wanted it to be a place that provided the solution, and the solution is Jesus. Without him it never changes.” Anybody can come in and see a diversity of people from the homeless, to students and business people. “We are a church and we have this facility that is open 6 days a week. You come in and everything is free. The neighborhood can, and does, come in. Everybody can co-mingle and coexist.” Steger says that he really believes that this is what the church in the 21st century is supposed to look like. The Hub is always looking for donations, but the need through the winter will be for heavy coats, sleeping bags, blankets and tents. Steger also says that they are always looking for partners who will come down and serve alongside them. “We have outreach every single day. If you want a place to do mission work in North America you can come right here.” He tells us that several churches are already planning summer mission trips at The Hub. To donate or get connected, visit www.graceinthecity.org or call (612) 999-7991. It doesn’t take long for Sgt. Grant Snyder to spot those wholly unprepared for the bitter cold. They shiver at bus stops and huddle under store awnings. They have hooded sweatshirts, but no coats. They don’t have anywhere to go. From the back of his off-road vehicle, the Minneapolis police veteran doles out hats, gloves and blankets to those in need. He approaches each person like an old friend, often leaning in for a hug. “Where are you sleeping tonight?” he gently asks. Many wandering the downtown streets know him by name, but simply call him Sarge. On Tuesday night, as windchills reached dangerously low temperatures of 50 below, Snyder went searching for the less fortunate. A woman and a child wearing light jackets and sneakers approached him outside Target, where he’d stopped to do welfare checks. Her 10-year-old nephew’s small hands were red from the stinging cold. “You got any gloves?” she inquired. Snyder smiled and helped the boy try on a pair — albeit a few sizes too big — then handed him a cup of hot cocoa. Over a 48-hour stretch, Snyder gave away more than 100 pairs of donated hats and gloves. Long-term, he hopes the outreach efforts will help build relationships with people who are traditionally distrustful of law enforcement. It’s part of the reason he rides around in a souped-up Polaris rather than a squad car. Snyder says he doesn’t want to risk intimidating people. “We’re not interested in handing out citations or criminalizing homelessness,” he said, adding that those misdemeanors can be counterproductive by limiting housing options. A number of Twin Cities shelters announced they would remain open around the clock this week, but advocates say the shelter system is insufficient to house everyone who needs it. Others hunker down. Late Tuesday, Snyder found a man sleeping under a pile of blankets on the sidewalk near Hwy. 55. His fingertips were discolored and in the beginning stages of frostbite, yet he refused to go to a shelter. Snyder eventually called for a transport to HCMC for medical assistance. “It’s heartbreaking to make those calls,” he said. John Steger, Senior Pastor at Grace in the City church, partners with Snyder to deliver sandwiches and clothing to the homeless. Together, they helped bundle up Billy Townsend, who was pushing a walker across Nicollet Mall — intending to seek refuge inside Target until closing time. He gratefully accepted a scarf before pushing on.